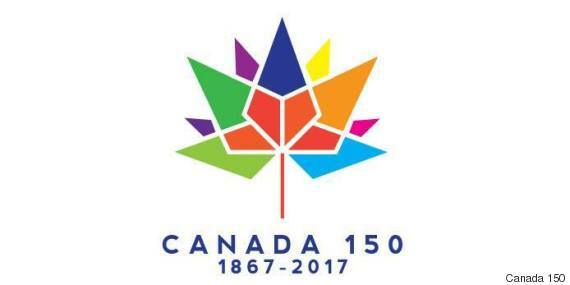 Canada's 150th Anniversary Logo Is Here. Designers Are Taking It Badly. What do you think of it, though? A 19-year-old student from the University of Waterloo has won a contest to design the logo for the 150th anniversary of Confederation. And the process by which it was obtained has irritated designers across the country. The logo, designed by global business and digital art student Ariana Cuvin, was submitted as part of a contest administered by Heritage Canada. Her design, unveiled last Thursday, topped 300 other submissions, according to The Waterloo Record. It won her $5,000 and it will be displayed on materials leading up to the 150th anniversary in 2017. Cuvin told the newspaper that she tried to avoid the maple leaf, but ended up designing one that incorporated 13 diamonds in different colours to illustrate the country's diversity. "I'm still trying to process it," Cuvin said of winning the contest. But designers across Canada are unhappy with the manner in which the logo was chosen ... and some aren't happy with the logo itself. Adrian Jean, president of Graphic Designers of Canada (GDC), released an open letter Monday saying the federal government "ignored the comments from professional designers and students across Canada and announced the 'winner' of their Canada 150 speculative logo contest." It had previously organized a petition against the design contest. Jean accused the government of "exploit[ing] students" and said contests such as this are "unethical, detrimental to students, to professional graphic designers, and to Canada in general." He went on to say that neither the winner, nor anyone else who submitted entries, received "due compensation for their time or intellectual property." "The government seems to have successfully exploited the intellectual property of students in the name of celebrating Canadian culture," Jean wrote. And he's not the only one who's criticized the contest. Earlier this year, the Association of Registered Graphic Designers (RGD) launched a boycott of the contest with the hashtag, #MyTimeHasValue. The campaign said design competitions have become a tool for businesses and governments to procure free work. A number of design professionals that The Ottawa Citizen spoke to were hesitant to criticize the winning logo itself. But Mark Busse of Vancouver design firm Industrial Brand said it "meets the minimum criteria of a usable logo." He went to say that the contest "basically flipped a double bird at what is arguably one of the most important industries in the emerging knowledge economy." Heritage Canada previously spent $40,000 to design five logos for the 150th anniversary that didn't exactly draw rave reviews from Canadians.